The septic system accepts wastewater from the home (sinks, showers, toilets, dishwasher, washing machine), treats the wastewater and returns the treated effluent to the groundwater. A conventional septic system is comprised of two components: a septic tank and a leaching bed. 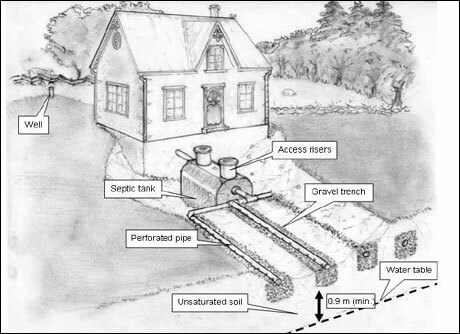 The wastewater exits the septic tank into the leaching bed  a system of perforated pipes in gravel trenches on a bed of unsaturated soil (minimum 0.9 m/3 ft.  see Figure 5). The wastewater percolates through the soil where microbes in the soil remove additional harmful bacteria, viruses and nutrients before returning the treated effluent to the groundwater. In cases where there is more than 0.9 m (3 ft.) of unsaturated soil from the high water table or bedrock, a conventional system is used, where the network of perforated drainage piping is installed either directly in the native soil, or in imported sand if the native soil is not appropriate for treatment. In cases where the groundwater or bedrock is close to the surface, the leaching bed must be raised 0.9 m (3 ft.) above the high water table or bedrock. This is called a raised bed system. Under certain site conditions such as limited lot area, high groundwater table or poor soil conditions (clay or bedrock for example), a conventional system will not provide sufficient treatment of the wastewater. Under these conditions, it is often possible to install an alternative treatment unit. The two most common types of alternative treatment units are trickling filters, where the effluent from the septic tank trickles through an unsaturated filter media (such as peat or a textile filter), and aeration systems, where the effluent from the septic tank passes through an aerated tank. Alternative treatment units provide a higher level of wastewater treatment, allowing the effluent to be discharged to a smaller area than in a conventional leaching bed. Effluent from an alternative treatment unit can also be discharged to a shallow buried trench, which is a pressurized pipe system 15 cm (6 in.) below the ground surface. In most provinces homeowners with alternative treatment units are required to have a maintenance contract with a service provider to inspect and maintain their systems. You should have the septic system inspected by a trainedon-site system professional prior to purchasing the home.. The inspection should include: a discussion with the homeowner, a review of the system permit, a tank inspection, a leaching bed inspection and a house inspection. Septic tanks should be inspected every two years and pumped out every 3-5 years. The visual inspection will indicate what the level of sludge is. The sludge should not be more than 1/3 of the tank volume. If it is too full, then the sludge, or any floating solids, can flow into the weeping tile bed. Over time this can cause blockages in the pipes of the weeping tile bed. Repairs to this portion of the system can be very expensive. adding any unnecessary water to septic system. Minimize the use of jacuzzi style bathtubs, spas, and hot tubs, as they contain large volumes of water and may flush sludge or solids out of the septic tank into the weeping tile bed. A septic tank is not a garbage disposal. Keep the following out of the tank: solvents, coffee grounds, cooking fats/oils, disposal diapers, facial tissues, condoms, bleach, pesticides/herbicides, eavestrough runoff, sump pump discharge, dead pets, bandages, paints, auto grease/oil, bones, paper towels, sanitary napkins, foundation drainage, carpet/upholstery cleaners, medicine, antifreeze auto/plumbers. Even bodily fluids from a person under going medical radiation, chemo, or high levels of antibiotics will potentially kill the natural bacteria in a septic system. 1. Does the homeowner have a copy of the septic system permit(s)? 2. When was the last time the septic tank was pumped out? Are there any records of the system maintenance (system pump-outs, repairs, recorded problems)? to infiltration of the well by leakage from the septic system and could indicate a malfunctioning system.